The Warby Parker Virtual Try On is Amazingly Effective and SO MUCH FUN! The Warby Parker Virtual Try On Feature is SO MUCH FUN! Warby Parker believes buying glasses should be easy and fun. If you've ever needed new glasses, you know that it's sometimes a tough job! I've known about Warby Parker brand for a long time, but I just checked out the site for the first time tonight. I'm not going to lie: I don't even need eyeglasses and I spent WAY too much time playing around with the Virtual Try On feature! You know how you always want what you don't need or can't have? Plenty of people are going to want to kick me for this, but I've always wanted to wear glasses. Don't get me wrong. I'm happy that my eyesight is good and my eyes are in goo health. I'm grateful to keep the expense out of our budget, and it's cool that I don't have something else to keep track of, but glasses always seem glamorous and hip to me. Maybe that's why I spent so long exploring all the amazingly trendy styles of glasses at Warby Parker and taking advantage of the Warby Parker Virtual Try On that's offered for every pair of glasses. 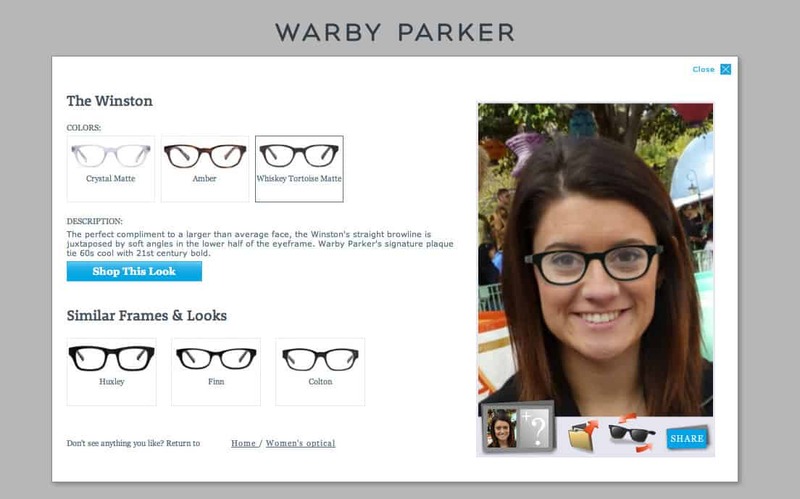 The Warby Parker Virtual Try On isn't just uploading a picture and having a pair of glasses superimposed on your face. Your photograph is analyzed, and the image of the glasses is tweaked and angled to give a realistic view of what they'd really look like. Once I had my picture positioned right, I tried on all sorts of styles using the Virtual Try On! 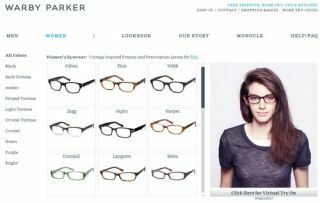 It's so cool that I could see exactly how any pair of glasses on Warbyparker.com would look on me, without ever holding them in my hand. 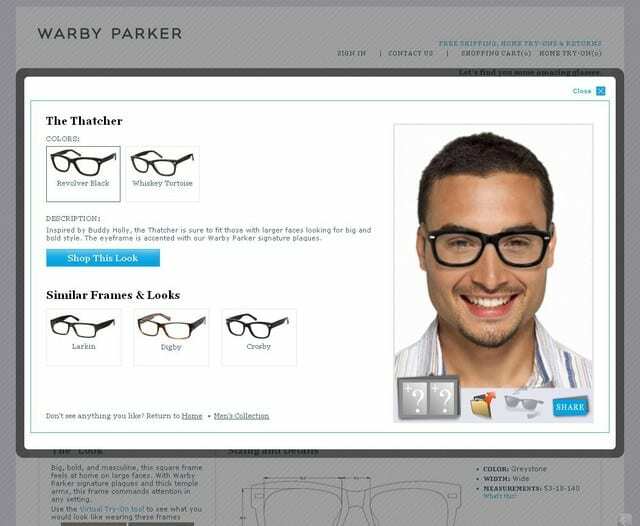 I even loved using the virtual try on at Warby Parker to try on sunglasses! 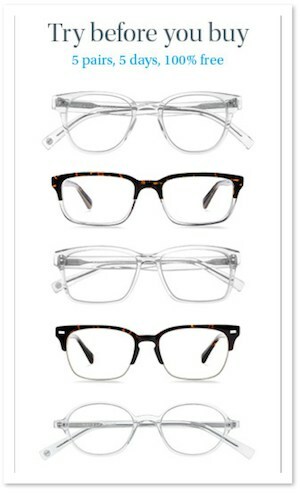 Browse various frames at Warby Parker and pick out 5 pairs. They will be shipped to you absolutely free! Try on your Warby Parker glasses in the comfort of your own home for 5 days. You can ask your family and friends what they think. Post pictures on Instagram for feedback and see if your friends on Facebook will vote for their favorite styles. If you don't like any of the frames or styles from the Home Try-On, you can pack up all your samples and send them back for free. Warby Parker even pays for return shipping, so there's no expense and you can look elsewhere for your new glasses. If you do have favorites, just go log back into Warby Parker's website and purchase the glasses you love the most. Pack up your samples and ship them back for free – there's no cost involved at all! 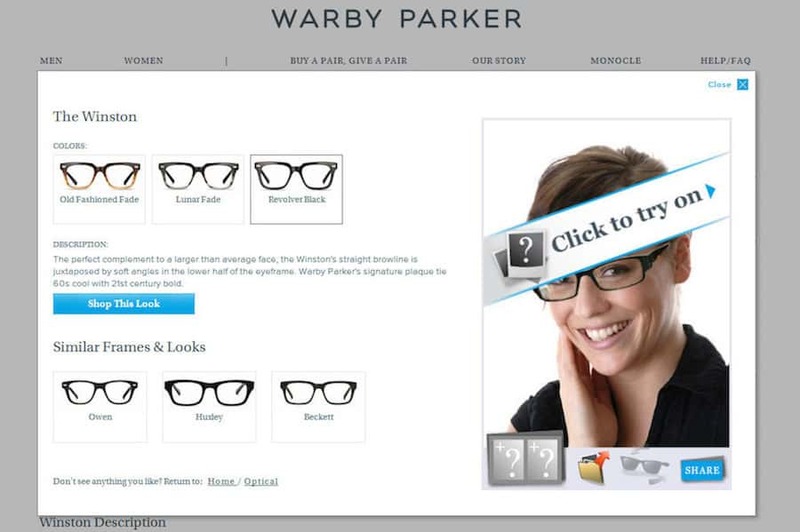 Learn more about the Warby Parker Home Try On and Virtual Try On programs!